View more video excerpts in our video library. A 7 day intensive in the unique approach to using Feng Shui principles and techniques for the southern hemisphere – including all workshops with the southern hemiphere approach to the form school, ba gua, ming gua, ba zhai, flying star, lo pan and the 4 pillars astrology. Not available from any other source. 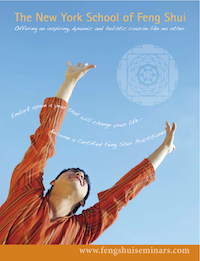 Become a licensed Southern Hemisphere Feng Shui practitioner! Become a Nutritional Coach and Natural Health practitioner. Study with some of the world leaders in natural healthcare and longetivity science in the world. Established more than 25 years ago, our Nutritional Coaching and Holistic Health Counseling Program is unlike any other program available today. Our powerful curriculum draws upon the time-tested Healing Arts of Macrobiotics, Traditional Chinese Medicine and Ayurveda along with cutting edge Western Nutrition, including the theories of the Weston Price Foundation. Learn how to create Life Enhancing Homes, Designed with Conscious Intention. The subject of Sacred Geometry springs to life in the hands of Michael. As an award winning Architect, he takes a holistic approach to design, based on the understanding that everything is connected, alive and conscious. His company, Holistic House Plans, is the world's largest online resource for building and space designs based on the natural harmonic principles of biological architecture, sacred geometry and feng shui. Each design is unique, and has emerged from an expression of natural patterns, symmetries, shapes, universal symbols and ratios. An exciting tour of several homes in Ireland that Michael designed. A sacred site visit of Newgrange and other sites. Note, Michael no longer travels to teach in the USA or else where. This is your only way to access Michaels dynamic teaching and far reaching material. Tao is most often translated as "way" or "path" and in this 4 day course our labyrinthine path leads us towards the center of Chinese Geometry. Deep within the ancient art and science of Geometry lies a beautiful and mysterious system of forms that has fascinated philosophers and sages from all spiritual traditions since antiquity. In this particular intensive 4 day training- we invite participants to awaken their own deeper levels of perception and to access the golden key of Sacred Geometry to unlock secrets encoded in the sacred symbols of China and the art of Feng Shui. This multifaceted course integrates hands-on geometric drawing with dynamic multimedia presentations and invites students to explore the harmonic balance of Heaven and Earth, Form and Emptiness, Science and Spirituality, Mastery and Mystery, Yin and Yang. A unique tour and retreat event based on the latest research, presented here for the first time, of internationally known Nostradamus authority Vincent Bridges, connecting Nostradamus' prophecies with Leonardo Da Vinci's most heretical art and providing clues to Provence's ancient, almost forgotten, variety of early Christianity. It was this alternative form of Christianity that provided the historical and spiritual underpinning of the original Grail legends. We will explore, on the ground, the locations and images of the true history of the Grail, from the Grail Castle of Les Baux to St. Trophime's hermitages and the Alyscamp, the most renowned of medieval burial grounds to the quarries of Glanum and the standing stone of Da Vinci's Virgin in the Rocks, from the gypsies of Ste. Maries-de-le-Mer to the rugged grottoes of the Magdalene, and of course, the lost city of Glanum Livii and its nympheum, center point of Provence's accidental pentagram. Could the Knights of St. John have inherited the inner secrets of the science of alchemy from their former rivals in Outremer, the Knights of the Temple? Examine the traditions and the real science behind the mysterious workings of Alchemy, from its discovery in ancient Egypt through its golden age in the late Middle Ages. Who were the "giants" who built the temples and vaults of Malta? Malta's remaining megalithic temples and chamber allow us to glimpse inside the spiritual perspectives of Europe's original geomancers, and from that perspective to understand in a deeper way the megalithic culture that once unified the continent.